Bliss: I know you can't give us any spoilers... but I was wondering if there would be closure at the end of the book? From the green-eyed cover girl its obvious Mimi is quite intently planning her bonding ceremony/wedding to Jack... so the question is, will we found out the outcome of that or will we be left hanging? Mel: Yes there will be closure! There will be new questions open in this book, but some very old ones that people want to know will be answered! Kady: So, I personally ship Jack and Mimi and was curious as to whether you honestly like how Jack is when he's around Mimi or when he's around Sky? Is he more of himself with the other? Which shipping do you like better? Also, why did Lawrence have to die? =[ He was the best. Is there anyone who has died in the series, so far, that you really wish didn't have to? Mel: I think Jack is a very complicated person and is being pulled in a lot of different directions, he's always wanted to be more than he is, always been drawn to the Light. He and Mimi are very dark angels, they are the angels of the Apocalypse and Lucifer's strongest former generals. In Jack, I always saw a character who lived pretty much the same life for centuries--but then there is this new thing, this new factor in the equation--embodied in Schuyler, which he's never encountered before. So what does he do? Would he follow his heart or do his duty? So it's hard to answer, because I have a lot of sympathy for Jack, I never like doing what I'm supposed to do, you know. But on the other hand, I also have an enormous sympathy for Mimi... so it's hard to answer your question! I think you just write your characters and then they choose for themselves what is true for them. I wish they could all live forever, but I really wanted to write a series that had real impact--that there would be such a thing as death and finality even in the immortal world. Because that's what we have to deal with in our own lives. I wish I could bring them all back! But you know, you have to be truthful to the story you are telling, and life involves a lot of suffering. Jackie: I was wondering if you could describe Mimi's headdress and face painting at her after party in Masquerade. Mel: I always imagined Mimi in some kind of fabulous huge Native American headress with white feathers, and then super-cool face painting with black lines on her cheeks and something really fierce on her forehead--maybe look up some Native American traditional dress online? She would have to look like a warrior, so maybe a Cherokee? Weren't they the fiercest of the tribes? Loki: If a blue blood's bond dies from a silverblood attack, is that blue blood allowed to take another as their spouse? Mel: Blue Bloods who have lost their bondmates are allowed to marry - but it would be just a normal human joining, not a heavenly one - kind of like a marriage of convenience, like the one that binds Charles Force and Trinity Burden. Trinity lost her soulmate in the Wars, and Charles was shunned by his vampire twin, Allegra. Rach23: I dont know if this has been answered, or if its in the books and i missed it, but does each vampire look the same in each cycle? Like does Mimi always have blonde hair and green eyes? Mel: Since they've been around for so long, I would think that they wouldn't necessarily look exactly the same all the time for each cycle, the spirit is not bound to genes, like in humans. But some of their essence is the same, so I always imagine that Mimi's eyes look the same in a way, maybe if not in color, but in shape, or in some kind of way. Bliss: If a blue blood child were to die (way before them become unkillable by normal means), would the blue blood in him/her be dead for good? Mel: The Blue Bloods are long-lived and cannot be killed in any normal fashion, they would have to be killed with a weapon that held the black fire, that is the only way for the blood to be destroyed. But their blood would have to be saved in order to be reborn, so if the young Blue Blood was "killed", let's say in a car accident, and if they were able to save the blood that held the immortal spirit, then the spirit would not die. However if no one is able to save the blood, then yes, that spirit would never be called up again, and would, in a sense, be dead. But that really doesn't happen with the Blue Bloods...they are very careful to keep the living blood protected. Starberry: Where is the blood kept of those who are in the passive state, who has access to it, and can it be corrupted? And how was the blood preserved before modern technology, i.e. electricity? Mel: The blood doesn't need technology to be preserved, it is living, no matter what temperature, it's immortal, so there's no reason for it to be preserved. But it is guarded. And we'll find out more in the later books about the rules that govern the cycle and how it all works! I had a chapter in Van Alen that dealt with this but I had to take it out for pacing purposes, but we'll see it in a future book. Starberry: Who's Regis when Michael is in the passive state? Mel: There is a Regent that he names to lead the Conclave when he is not in cycle. Starberry: How long were Allegra and Steven married before Schuyler was born? And when is her birthday, just our of curiosity? Mel: This will be answered in future books and Allegra is a Leo. Freaking Amazing Person: I understand the whole bringing blue bloods back through implanting them into other blue bloods to carry on the line...but, I was wondering that if two blue bloods wanted to produce children the natural way, and not use implantation, would they have a red blood? Are they even capable of producing or does one parent at least need to be a red blood? Mel: They would not be able to reproduce, so even if two Blue Bloods wanted to, they could not. Schuyler is the only one who is a new spirit, and her father is human. Freaking Amazing Person: Also, how does being a silver blood affect the implantation/natural production in general? Or even the mixing of any bloods...ie, blue/red, red/silver, blue/silver, etc. Mel: Remember the Silver Bloods are Blue Bloods, except that their bodies house multiple spirits instead of just one, so they would not be able to reproduce either. MarthaWashington: Let's say that Jack decides to be with Schuyler and he breaks his bond to Mimi, assuming that he survives whatever the consequences are, could he ever get back with Mimi in another life or would the bond be broken forever? Mel: The bond would be broken forever. That's why it's such a serious decision! There's no turning back if he does it. Kacilin: Alright, so I was wondering if you've ever had any dreams from one of your character's point of view and if you've ever used that in your writing? Mel: That hasn't really happened, my dreams are more of writing the books, missing my deadline, sitting in front of the computer. How sad! LOL! But I think about them all the time, mostly the story and how they are acting to the things that are happening to them. Kacilin: Also, which character would you say you can relate to the most? Mel: It's hard to say because when I envisioned the three girls, they each have a part of my personality, and they are each a product of my experiences...that said, in the first book, a lot of Schuyler's alienation and sarcasm is mine, and then Mimi is just the easiest to write because she says all the things I wish I could say but never do. And I just love Bliss, I feel very protective of her. And she's so surprisingly strong. Kacilin: And if you could take the place of any of the characters, which character would that be and why? Mel: They all have a pretty hard road ahead so I don't know if I would want all that responsibility! Loki: Another silly question. If Kingsley is a silverblood and he is supposedly good, and silverbloods need blue blood to carry on, then how is Kingsley kept alive and tamed without sacrificing blue bloods? Mel: No questions are silly! No worries!! But sorry - this question will be answered in Van Alen Legacy. Loki: One more; Being a half-blood, is Schuyler able to eventually bond and continue the lines of blue bloods? Or will her next of kin be more and more dilute? Mel: This, I think is one of the biggest questions of the whole series, and will be answered in the final book. I'm sorry! But isn't it fun to find out through the story instead of just me telling you? Force_girl: I Love your books! what i wanted to know about TVAL is if Jack and sky will get a chance to be together again, basically will there be romance...haha i know you can't give spoilers but is there a possibility or is it really OVER? Mel: There is a LOT of romance in this book, and you will find out the answer to your question when you read it. Starberry: Does Jack have to verbally declare that he's going to deny their bond, if he chooses to denounce it or could the bond be declared void another way? Starberry: When Schuyler's and Jack's birthdays? Mel: I think Jack is an Aries and Schuyler is a Virgo. Starberry: What was Allegra's role exactly on the committee? And why was Charles chosen as regis instead of her? Mel: Charles is the archangel Michael, and he has always been the leader, Allegra had a big role in the Blue Blood community but not necessarily in their leadership, she was more a spiritual leader than someone who ran the organization. Rose: Hey I was just wondering...in Blue Bloods it's stated that Schuyler is descended from two presidents, but then in Masquerade Lawrence says that Blue Bloods aren't supposed to hold office. What's the deal? Are the presidents on her father's side? Mel: As Cordelia said, no one really adheres to the Code anymore, so there have been a lot of Blue Bloods who have held office. It's not something they wanted to happen, but certain Blue Bloods have done it anyway. 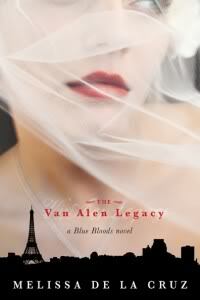 The series is about the decline of the Blue Bloods' world and their values, and how the Van Alens want to bring it back. And as for your question about Sky's dad, you'll find out in the book I'm writing now, Misguided Angel, a little more about his background. Rose: Sorry one more question...I'm a Jack/Mimi fan. Will we ever find out how they fell in love, and also why they were made human twins in this cycle when they never were before (according to Masquerade)? Mel: Hmm... I don't know. Possibly. And the last question about Mimi's outfit - yes she was still wearing the white dress. That's all I have time for, thanks everyone for coming out and hanging out and asking all your fun questions!!! There will be a lot of answers in this book and in a lot of future books! Hope you guys enjoy Van Alen Legacy! MarthaWashington: If Jack goes through with the bonding would his feelings for Schuyler just disappear because of the reunited connection with Mimi or would he still long for her? And if he did still want to be with her, what would be the consequences for him cheating on Mimi? Mel: If he bonded to Mimi, he would completely forget about about Schuyler, there would be no cheating.